The Rhine River represented the last natural defensive barrier for the Third Reich in the autumn of 1944. Although Hitler had been reluctant to allow the construction of tactical defence lines in France, the final defense of the Reich was another matter. 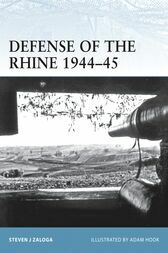 As a result, construction of a Rhine defence line began in September 1944. Steven J. Zaloga examines the multiple phases of construction undertaken to strengthen the Westwall (Siegfried Line), to fortify many of the border villages, and finally to prepare for the demolition of the Rhine bridges. Using detailed maps, colour artwork, and expert analysis, this book takes a detailed look at Germany's last line of defence. Adam Hook studied graphic design, and began his work as an illustrator in 1983. He specializes in detailed historical reconstructions, and has illustrated Osprey titles on the Aztecs, the Greeks, several 19th-century American subjects, and a number of books in the Fortress series. His work features in exhibitions and publications throughout the world.